ANTIPHONARIUM - Leaf on vellum from an antiphonary. 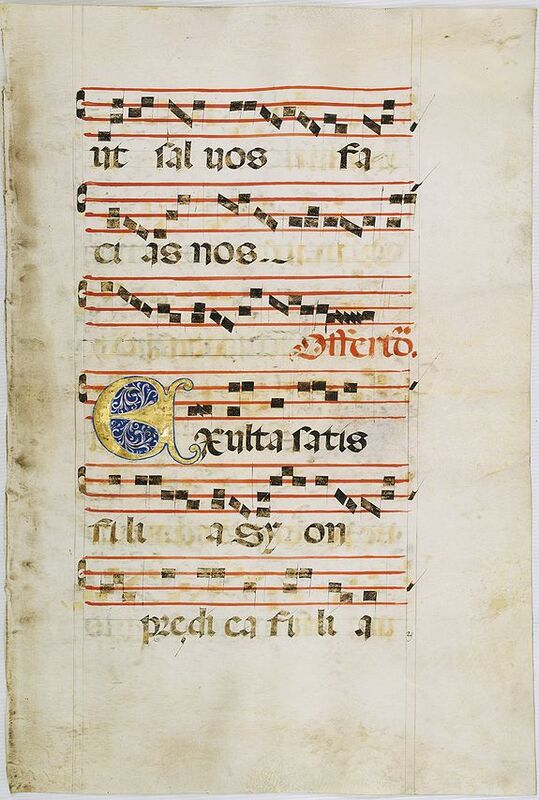 Title : Leaf on vellum from an antiphonary.. Size : 25.6 x 16.9 inches. / 65.0 x 43.0 cm. VERSO: The staves are in red and the notes in black. On extremely heavy vellum (most likely ox) Wide margins. Two 1 line initials in burnished gold. The antiphonal - as it is also called - has a large format because it was used by a whole choir and all the singers could have a look at it ! Condition : Lines written in rounded gothic script, written in black ink, on a four-line-stave, with headings and rubrics in red. Page lightly stained and toned.